We felt we'd found something truly special when we visited Arrayán early last year, when our recommendations were mostly met with curiosity amongst Americans who had likely never heard of this tiny region just south of Madrid. A year on and we're finding their uniquely artful label on tables and shelves in a number of great restaurants and wine shops. We could not be happier to see such a worthy winery at the forefront of expanding Americans' taste for Spanish wine beyond the country's long-famous regions of Rioja, Ribera del Duero, and Priorat. 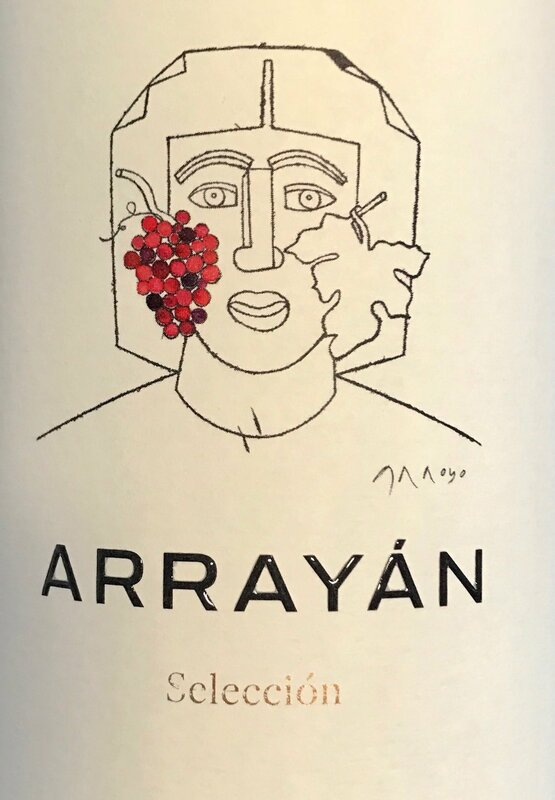 Wine lovers in the Washington, DC area should seek out bottles from Bodegas Arrayán at the Dcanter wine shop at 8th and G in the Eastern Market neighborhood, or of course on the wine list at Joselito. Otherwise, it's most certainly worth your while to have your local wine merchant order you some bottles if they don't already have them on their shelves. Our latest tasting notes are below. We began our evening with a lovely rosé blend of Merlot (50%) and Syrah (50%) -- two grapes that one sees more often in Méntrida than in most of the rest of Spain -- paired with smoked mackerel with soy and a red fruit brine sauce, a particular treat because we had not tried the rosé last year when we visited the winery. It performed well, an extremely dry and full bodied rosé with strawberry candy in the nose and rhubarb (!) in the palate. All the great parts of a strawberry, without a lot of sugar sweetness. Our experience nearly a year later at Joselito backs this up. The rosemary roasted squab rice with which it was paired played excellently with the wine's natural herbacious qualities (coincidentally, there's a lot of rosemary growing near the vineyard). Alvaro, visiting from the winery and dining with us that evening, explained that these particular Garnacha grapes have a thinner skin and thus are a bit more delicate with lighter color -- a confirmation of our earlier observations. The wine is then aged in big barrels to avoid exposing it to too much wood as it develops, but then offers up a a very intense nose in the glass that feels darker (dark red stone fruit) than the wine itself, super smooth and fresh on the palate, a little graphite, light but velvety in the mouth. Delightful, as always! Paired with a stewed tuna and onions, Pedro Ximenez reduction and sautéed almonds, this blend of 30% Syrah, 30% Cabernet Sauvignon, 30% Merlot, and 10% Petit Verdot (try finding another one of those in Spain) throws a very full bodied nose featuring black pepper, mint, and wintergreen. 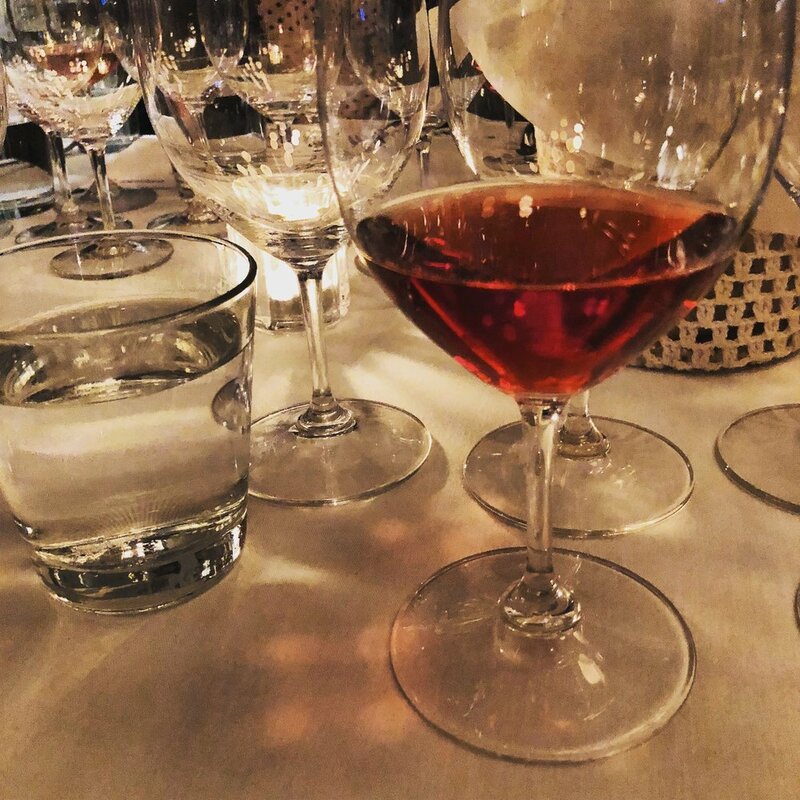 The palate offers a very delicate, fresh taste that works well today as a still-young wine (for what it is), but will develop deeper character if aged rather significantly. Our previous observations hold up a year later: "A fruit medley dominated by ripe raspberries and gentle spice. Cranberry was present earlier on at first opening, but they've mellowed slightly as a bit of mint and nutmeg have entered the complex scene. Velvety, but with some mild tannin in the mid-palate, we found that notes of black tea mingled fruits that are far more subdued in the mouth than they were in the nose. A bit of plum asserts itself in the end, and the mint persists throughout." ...Chef David Sierra of course impressed with several other courses paired to several other of Arrayán's wines, but the truth is that by the time one is halfway through the marathon that is a night at Joselito, you're beyond producing the most insightful tasting notes. We've multiple bottles of everything in our collection. You should too. Cheers!